Kondor is obliged under these regulations to offer our customers free take-back of their WEEE on a like-for-like basis when they buy a new Electrical or Electronic product from us. For example, if a customer bought a new Headset from us we would accept their old Headset and prevent it going into a landfill site by disposing of it safely. Customers must return their WEEE item to us within 28 days of purchasing their new item. To return an electrical item of the same type that you have purchased please email three-accessories@three.co.uk and request a prepaid returns envelope. Please indicate which new item you have purchased to enable us to send the correct size envelope. Alternatively you can take the item to your local council recycling site. 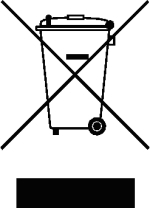 Under the WEEE Regulations, all new electrical goods should now be marked with the crossed-out wheeled bin symbol shown on the right. Batteries and Accumulators and Waste Batteries and Accumulators Directive is now UK Law. All members of the European Community have a legal duty to minimise the unsorted disposal of batteries. Batteries must not be thrown away in household waste. Recycling items helps to save our natural finite resources and also reduces the environmental and health risks associated with sending batteries landfill. You can play your part in minimising the effects, to the environment and human health, of the hazardous substances found in batteries by reusing or recycling the items. Kondor is obliged under these regulations to offer our customers free take-back of their batteries. We will take back batteries at our premises, please see your invoice, receipt or our website for the address. You must not post batteries back to Kondor as there is the possibility of damage and leakage which will affect the environment. Alternatively many large high street stores now provide a facility to return your old batteries for recycling. Your local council waste site will also have facilities to recycle batteries. Please do not dispose of batteries in household waste. Help us to avoid damage to the environment by recycling all your batteries and electrical items. Visit http://www.recyclenow.co.uk where you will find information regarding recycling and also the location of your local recycling centre. Please do not attempt to remove fixed batteries from equipment as they could explode or leak chemicals. NOTE no money or credit notes will be given for old items being returned. Batteries that were placed on the market after 26th September 2008 should display the WEEE symbol.